Me in front of the movie poster, in a lightbox like it’s Now Showing and everything! It’s pretty well-known at this point that the Ratchet movie didn’t do well. It wasn’t received positively by critics, it tanked at the box office (not even making its meager 20 million dollar budget back), and all in all did its best to uphold the typical standard for video game movies set by releases like Mortal Kombat and Prince of Persia. As a result, the film was pulled from theatres in my home country of New Zealand (and I’m sure several other countries as well) before I ever got the chance to see it. I pretty much knew the plot though; the novelization came out several weeks before the film did, and the renowned PS4 game included clips directly from the movie. I wouldn’t get the chance to watch the film itself however until early August when it came out on Blu-Ray (and even then I had to import it from Australia; New Zealand only got it on DVD like it was 2005). 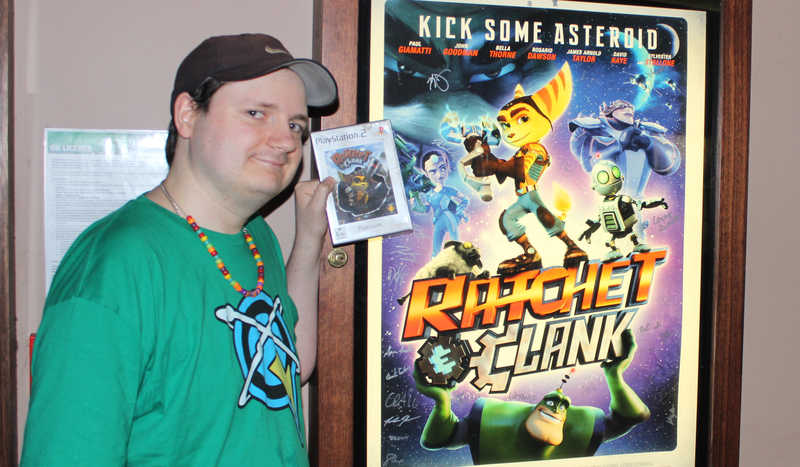 With my penchant for Ratchet-related projects like writing Timelines for both the games and the movie, or the Ratchet & Clank Ranked article I did a while back, it should come as no surprise that I wanted to do something special for the movie. I wanted to watch it in a theater, the effective New Zealand premiere of the film. For someone who’s never organized an event of any kind in their entire life, this was a daunting prospect. I did know from the start which theater I wanted: The Roxy, arguably the most prestigious cinema in Wellington. As it turns out, from a legal standpoint watching a film in a private theater with family and friends doesn’t count as a private screening. In fact the only situation where it would be considered private would be screening it inside a house, which kinda goes against the point of what I was trying to do! As a result, I’d have to go through the process of obtaining the rights to screen the film. The movie poster I received in its light box at the front door! That involved going to Roadshow Entertainment. While CMG helped produce the film, because Roadshow released the film in Australia and New Zealand on DVD and Blu-Ray, they would be the ones to talk to. Thankfully, they granted the rights to screen the movie to me and the Roxy. However, a snag was brought up by Roadshow: because the movie was never released here, it was never given an actual rating, which I needed in order to go ahead with the screening. To do this, I went to the Film and Video Labeling Board, a local organization who grant ratings and give them to new movies. I was able to register the movie on their website and requested it to be rated, which it got a few days later. I was even sent a certificate acknowledging that the film was officially rated, which I framed and have up on my wall. The Rating certificate as it appears on my wall. On the left is my corner for old consoles. Aside from the screening itself, probably the coolest thing was testing to see if the disc would work. I was taken up to the projection room behind the cinema we would be using the next night. The projection room was really cool. No old-school style film reel projector here, it was an enormous black box the size of a large set of drawers, and made so much heat it was connected directly into the building’s ventilation system! The next day was movie time, November 8th. I picked this date for the screening as it was the day the original 2002 game released in SCEE territories fourteen years prior, so of course I brought along my copy of the original game. I also put up an actual poster of the movie, graciously provided and signed by Insomniac Games themselves that I received the Friday before. I was even allowed to put the poster up in one of the Roxy’s poster light boxes, which was a real treat to see! The Roxy, the cinema I held the screening in. That’s a statue of Gandalf in the corner made by Weta Workshop. A really cool thing that happened that day was when I tweeted out that I was holding the event that morning. Insomniac’s twitter picked it up and retweeted it, and a local Ratchet fan picked it up whilst scrolling through their feed. Turns out, he lived in the same suburb as the cinema and was able to attend! The film was also attended by my family and several of my animation co-workers. Everyone had a great time watching the movie, and I’m fairly confident it was a once-in-a-lifetime experience as the film will likely never be screened in New Zealand again. As well, with the movies run being long past, it was likely the final time the movie would be shown on the big screen. But regardless of those details, I’m incredibly proud of what I pulled together, such that I find it difficult to put into words. It’ll be something that I’ll fondly and proudly remember for the rest of my days.